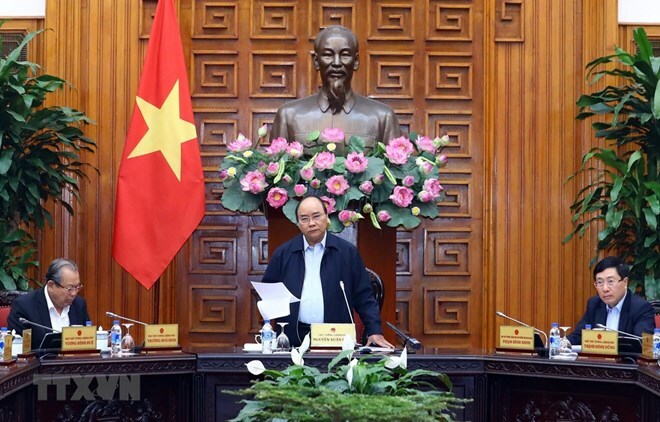 Hanoi (VNA) – Information work plays an important role in consolidating public confidence in domestic production, Prime Minister Nguyen Xuan Phuc has said. This is one of the directions the leader has made during his working session with representatives of relevant ministries and agencies in Hanoi on March 18, which sought solutions to remove difficulties to production and business, and ensure the yearly growth target. He urged agencies to take drastic actions in order to consolidate confidence of people and businesses, saying dealing with institutional shortcomings should be the most important task. Besides, it is necessary to handle limitations in coordination between ministries, agencies and localities, he said, suggesting the organisation of conferences on key economic zones in order to address specific problems. The PM asked ministers and local People’s Committees to trace obstacles to the disbursement of public investment. Greater efforts should be made to ensure credit growth in support of production and business activities, prevent and control African swine fever and keep farm produce export at 43 billion USD as set by the Government. The construction, and natural resources and environment sectors were requested to speed up the implementation of existing projects, while the Transport Ministry was asked to promptly implement large-scale transport infrastructure projects, with a specific schedule.